In the previous post “what is an Internet Exchange Point?” we introduced the IXP and mentioned and explained some terms used in IXP world like Peering and agreements. If you haven’t read the post I would encourage you to read that first, especially if the term IXP is new to you, and then continue reading this one. In this post we will have a look on some statistics on the number and locations of IXP’s in the world. To write this blog which of course is also a part of my university thesis (working on it) I have taken help from the PCH website and from an outcome document of the IGF 2015. The IXP model of network interconnection and traffic exchange is a widely-adopted industry practice with nearly 512 active IXP’s in 130 countries. According to the Packet Clearing House (PCH) 51 more IXP’s in 29 countries are planned to be stablished. 10 out of these 29 countries which also includes Afghanistan will be establishing an IXP for the first time. "512 Active IXP's in 130 Countries"
The following table shows the total number of IXP's by region. It also helps you to understand which region has the highest number of IXP's installed, in how many countries and cities. With 6.04T data peak, Deutscher Commercial Internet Exchange DE-CIX Frankfurt, is the biggest IXP in the size. It was established in 1995 and has 776 members. 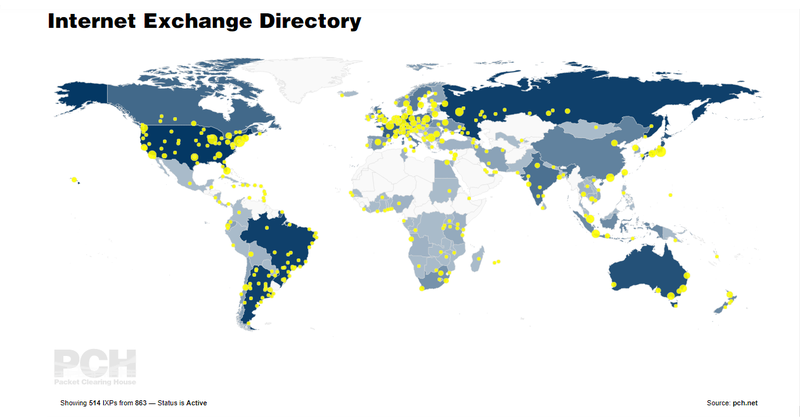 On the other hand, Ponto de Troca de Tráfego Metro São Paulo, located in Brazil is the IXP with the highest number of members. It has 1467 members and was established on 4 October 2004. The location and numbers of an IXP can be selected by considering many factors, such as country demographics, market conditions and global economy. Most of time, the countries with one IXP have it located in the capital city as it totals the most of the population of a country. The 2nd IXP will be placed in the 2nd populated area or city in a country. "10 more countries, including Afghanistan, trying to Establish an IXP for the first time"
The market dynamics can also have an impact on the number and location of IXP’s in a given country or region. In some territories, the size of the Internet industry (ISP’s, content providers, data centers, etc) has resulted in the development of multiple IXP’s to provide sufficient space for the growth of the traffic exchange among the networks. And finally, the global economy can also has its impacts on the numbers and location of IXP’s. For an instance, there would be a larger concentration of service providers, carriers and data centers in the region that has a higher dependency on digital economy, which fosters demand for IXP’s. Just recently I came to know that Afghan MCIT (Ministry of Communication and Information Technology) is working to complete NIXA (National Internet Exchange of Afghanistan) on which they have been working since 2011. but still this was not any official announcement, I came to know about it during an unofficial discussion, lets hope for the best.